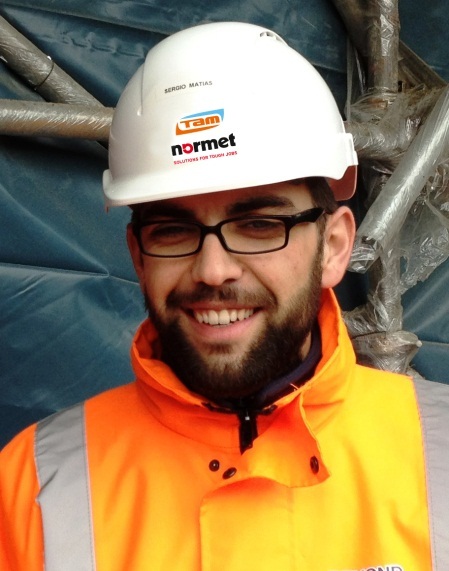 From October 2012 Sergio Matias has joined the Normet UK team as the Technical Manager for underground construction and mining. Matias is part of a 10 man team dedicated to supporting tunnels contractors, mining companies and designers. Matias is a Civil Engineer and originates from Portugal. He has had numerous roles in his relatively short career essentially focused on high performance concrete production in such places as Angola, Portugal and now the UK. His recent role developing high performance sprayed concrete on Crossrail as a contractor has further broadened his technical capability. Normet actively support the technical development of underground processes through active participation on international and national tunnelling and mining forums. Matias is supporting the industry as a member of the new BTS SCL Best Practice Group and actively contributes to the group reviewing applicable testing methods and materials for successful sprayed concrete tunnel linings. Fico muito feliz pelo seu sucesso profissional. Quando tiver um tempinho quero mandar-lhe um e-mail “como deve de ser”. Quando pensar vir a Portugal avise com antecedência pois gostaria de estar consigo. Ás vezes vou sabendo notícias suas pela Rita.